How to take care of your mattress? Your mattress is one of the biggest investments you make for a good night sleep, so taking care of this investment is important. Studies show that an average person sweats out half a pint each night, and needless to say, most of this sweat ends up in the mattress, pillow, duvets and the linens. A good mattress can last for years if you take a good care of it. It is important to rotate your mattress once a season. Do not flip your mattress, as it is designed to be one sided. Naturally, your body makes more pressure on some parts of the mattress and less on some other parts, your hips transfer the highest pressure while your feet don’t. 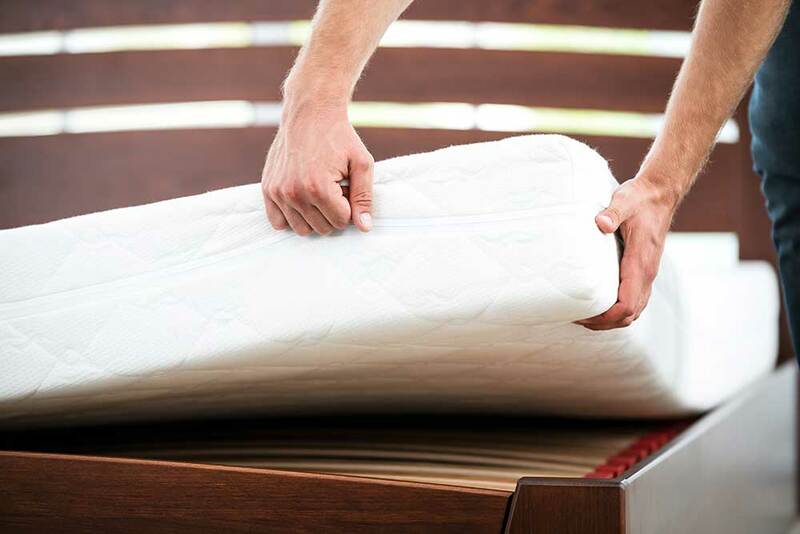 In order to prevent your mattress from losing its perfect shape, rotate it regularly and allow some time so it can get back to its original form. You read it right! An average person sweats out half a pint each night and that it is unavoidable. To keep the sweat away from your mattress, you should use mattress protectors. These useful protectors can easily be removed and washed, and act as a barrier to unwanted dirt and sweat to the mattress. Some mattress protectors come in the form of encasement which is bed bug and dust mite resistant. Your mattress hygiene is maintained. Don’t know where to get mattress protectors? Don’t worry, we’ve thought it all, check Eversoft’s mattress shop and pick the protector for your mattress. A breakfast in bed sounds fancy, doesn’t it? But think twice! all those tiny breadcrumbs falling on the mattress make a fancy meal for the dust mites too! These small creatures live on our skin sheds and small food particles falling on the mattress. So we have to say a breakfast in bed isn’t so fancy after all! We talked about dust mites above but we forgot to mention where they love to live. These microscopic monsters love damp, warm and dark spaces where they can get plenty of food! That is why mattress experts strongly recommend you keep your bed dry. Foam is dark and the body temperature makes it warm. So you need to keep it dry to keep the mites away. Do not go to bed with wet hair and don’t leave your wet towel on your mattress. https://www.eversoft.ca/wp-content/uploads/2017/07/How-to-take-care-of-your-mattress.jpg 667 1000 F.A https://www.eversoft.ca/wp-content/uploads/2017/04/Eversoft-Logo-1030x264.jpg F.A2017-10-24 19:07:362017-10-24 19:07:36How to take care of your mattress? Which Mattress is the BEST for you? How to design and make your own Mattress?